Many of us love sports. So, with the attention on women's leadership and advancement, I thought I'd focus on how this issue plays out in the traditionally male-dominated sport industry. And even if you are not a sports fan or an athlete, changes are happening in the industry that will give you opportunities to play a key role. 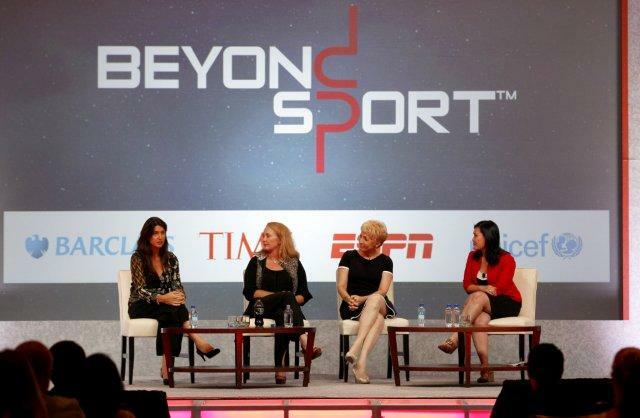 Last week, I had the honor of sharing the Coach K Center's 2013 LifeChat Series on Women Leaders in the Sport Industry and moderating a panel on this topic at this year's Beyond Sport Summit. Beyond Sport is about leveraging the power of sport for societal change. It draws leaders such as Dikembe Mutombo, NBA Commissioner David Stern, Jeff Lurie, Owner and Chairman of the Philadelphia Eagles, Gov. Ed Rendell, Tim Shriver, CEO of Special Olympics and Rita Benson LeBlanc, Owner and Vice Chairman of New Orleans Saints and Pelicans. The 750 some participants represented the private, public, and social sectors. Generation-wise, in the room were the current and future leaders of the sport industry. And different from most other sport gatherings, there was a 50-50 gender split. When you connect the dots, this is a glimpse into the demographic changes that are happening in sport. It's against this backdrop that my panel explored these changes and how the industry can harness these demographic shifts and catalyze further change. My fellow panelists represented three completely different parts of the industry - from franchises - Jean Afterman, SVP and Asst. GM for NY Yankees; from media - Laura Gentile, SVP of ESPNw; and from sponsors - Sharon Byers, SVP of Sports and Entertainment Partnerships for Coca-Cola North America. As with everything else, globalization and technology have transformed the sport industry over the past decade, leading to new ways of experiencing and consuming sport, and subsequently, new opportunities for business and society. Concurrently, Title IX has also changed the sport demographics over the last 40 years. Women have not only become part of the fan base, but also decision makers, change agents, and major players in the industry as a whole. Because of the growth in the number of female fans, Afterman noted that the Yankees sell more women's apparel than any other merchandise in its shops. We also see the growth and consumption power of this fan base at the NFL. It's not a surprise that we see more ads on TV and in print for the NFL Shop geared towards women. The growth continues into the next generation - Brett Taber, Marketing Coordinator of the Minnesota Vikings had shared with me that females represent 40% of the participants in their youth programs. Afterman also commented that she is seeing changes in the front office of the franchises and leagues. Media plays a key role in shaping participation in sport (see my piece on the Legacy of London 2012). Marie Wilson once said, "We can't be what we can't see." Through media such as ESPN and ESPNw, we see women play and women win. Furthermore, I believe these images can shape how boys perceive girls as well as how girls perceive themselves and their capabilities. And Gentile noted, it's important to include men in the shaping of the demographic changes. That's why ESPNw's advisory board also includes luminary male leaders such as Henry Friedman, Richard Lapchick, Jordan Metzl, Russ Rose, Kevin Stone, and John Walsh. Women's participation in sport has effects beyond the sport industry into the boardroom. The Ernst & Young Study released this June showed that 96% of the C-suite women surveyed had played a sport. Byers, who oversees sport marketing and partnership for Coca-Cola North America, talked about the company's interests in women's advancement through programs such as 5by20 program, to support 5 million women entrepreneurs in its global value chain by 2020. Women are key part of Coke's consumer base and within Coke's leadership ranks. Coke is known for its shared value approach - in creating campaigns that have a social and business benefit and strategic alignment. That same approach and circular reinforcement can also be applied in the sport industry. Underscoring all of this is the need for the business case to exist. The social agenda alone is insufficient for sustaining the momentum in women's advancement. It has to be an integration of the business and social agenda (see my piece on Why We Need a Few Good Men). Going forward, these demographic changes, coupled with the expansion and evolution of the industry have led to new and multiple pathways for women into the executive suite in sport. Looking at the backgrounds of the women featured in the LifeChat Series, we see education, politics, journalism, marketing, law, as well as the more traditional athletics background. There are more opportunities for women (even those who do not have a sports background) to enter and transfer valuable skillsets and experiences into the industry. These opportunities come during a time when more diversity of perspectives is needed to craft business strategies that respond to the opportunities presented by these demographic shifts. Whether they played team sports in their personal history or not, these leaders all understand the power of collaboration. Each of us play multiple roles - at home, in our social circles, and at work. And in each of these settings, we can't succeed alone. We are where we are and can continue to grow only through partnering and collaborating with others. But this also means we need to be good team players and give back to those around us. In short, the industry can continue to grow and fully leverage the opportunities that this new world has to offer by leveraging the power of diversity in thinking that comes from having men and women at its helm. In turn, it can also shape the world outside of sport by conscientiously fueling the mass participation of both genders in sport. The impact will be beyond sport.